WORTH NSA SYNTHETIC HOT DOT NHD12SY. 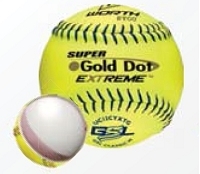 These 12" slow pitch softballs have .52 C.O.R. and 275 lbs compression with black stitching and are approved for play in the NSA. Softballs features a ProTac synthetic leather cover with Worth's C-LOK technology that repels moisture and maintains higher compression. 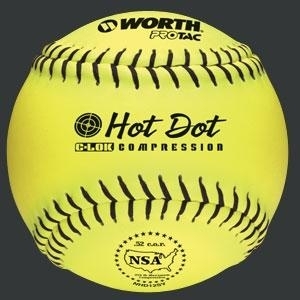 Worth Hot Dot softball technology is designed to give players consistent hit distance at all temperatures, especially in hot weather conditions.